Not an authentic recipe, kind of Asian fusion that I throw together. Easy recipe. Tangy and spicy rather nice and very pretty. Roast/bake the aubergines at around 180deg C for about 45 minutes or till really tender and soft. Leave to cool a little then break them up into small pieces with 2 forks. To make the dressing, mix all the ingredients together. 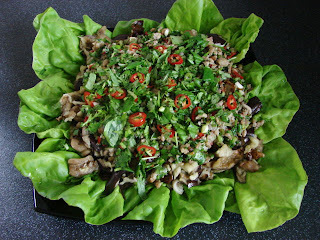 To assemble the dish, in a bowl mix the roasted aubergine, cooked pork mince and ¾ of the dressing and ¾ of the chopped sweet basil and coriander together. In a large serving plate, line it with some lettuce leaves. Then pile on the aubergine and pork mixture. Sprinkle on the remaining dressing on top, the remaining basil and coriander and maybe some more chilli. * If you like a bit of crunch you can sprinkle on some roasted and chopped peanuts. Anything with aubergines in it gets my vote!